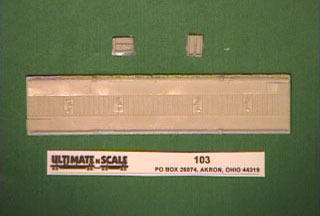 Flatcar kits come as under frame and deck with ramps for each end and brass stirrups. 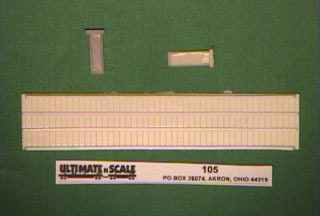 Flatcar kits do not include trucks or couplers. The flatcars are weighted for optimum performance in TOFC trains with UNS trailers. Starting in 1959, 85' flatcars were built. However, the 75' cars lasted into the 90's. The 75' cars were designed for two (2) 35' trailers or three (3) 20' to 24' trailers. 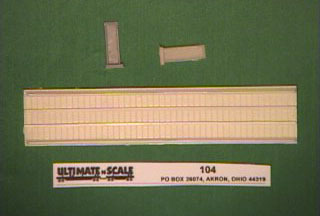 Deck, flatcar and trailer kits do not include pins or hitches. This enables the customer to use any method desired. Our kits are unpainted resin castings containing small parts and are breakable. Please keep all UNS parts away from small children.